Humainologie is a social enterprise operated by Calgary Centre for Global Community, a Canadian registered charity. We are multi-media production house that works with clients seeking multimedia productions, primarily documentary short films, for dissemination to their audience. Our contracted productions are a potential fit for a variety of clients, from museums, art/film festivals, to charitable organizations of all sizes. The profits from our work go back into our charity. All of the proceeds of the work we do goes directly back to the Calgary Centre for Global Community to ensure our sustainability and to enable us to continue to do and grow our important work. Working with us means your costs go to a good cause. We only produce content that supports our focus areas. We select projects that uphold who we are and what we want the world to look like. As a social enterprise available for hire producing works for others, all new project requests are considered in relation to how well the align with our charitable mission of the recognition of our shared humainty by removing barriers to human connection, increasing empathy for one another, and stimulating individual ability and openness to make new connections and deepen existing ones. Our films are about telling human stories, sharing experiences, enhancing understanding, creating empathy and connection, and diminishing the distance between self and other. We have experience developing content in a variety of languages. To date, we have worked on various film projects in English, French, Arabic and Bengali. We are eager to grow our list. We are not set up as a business, but a social enterprise. Our profit margins and costs of operating as a not-for-profit are lower than a typical business. This enables us to price our work competitively. In 2016, only 10% of our total expenses were spent on administrative costs. We use professional industry-standard film and recording equipment. In 2016, six of our films were selected in two film festivals and we received the Rising Star Award in the Canada International Film Festival for our film Adnan – under an umbrella we met. 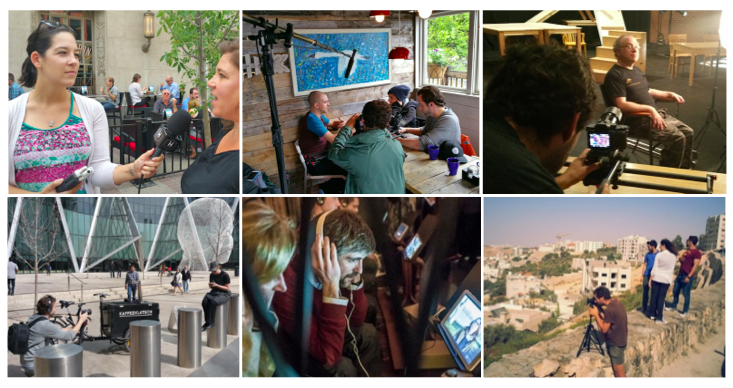 In 2015, we shot, edited, produced and launched eight short films in three countries in a total period of nine weeks. In 2016, we shot seven short films in less than four months across Canada for the Canadian Museum for Human Rights. We can work locally, nationally and internationally. We are not a corporate film production company. We understand the nuances of working in the public sector and with other not-for-profits. We have experience working with committees and creating content to suit the specific mandates of a client. We get the nuts and bolts of collaboration. We also know when it’s our turn to run with the ball. Check out the trailer for the seven films we produced for the Canadian Museum for Human Rights, currently on exhibit in Winnipeg, Canada. Contact us to request a Prospectus or discuss your project and how we might be able to work together.